Blog Posts: 200 Words or 2000 Words. How Do You Choose? Ahhh… the age old question. Does size matter? In certain aspects of life, size does seem to be important. Take height for example. Statistics show that on average, being an inch taller is directly correlated to earning $1000 more per year. It is a cruel fact of life that a six foot man earns $5000 more per year than his five foot seven equivalent. In other areas, size seems to be less important. Nowhere is this statement more true than in the natural world. While we obsess over the dangers of great white sharks and spotted leopards, minuscule microorganisms are the true bad-boys of nature. Think it’s impressive that an elephant can drag 20 times their body weight? The neisseria gonorrhoeae bacterium can pull up to 100,000 times its weight. Are you in awe of polar bears, who thrive in harsh subarctic climes? They look like survival amateurs compared to the deinococcus radiodurans bacterium, which can survive a nuclear crisis 1000 times worse than Fukushima. But when it comes to blog post size, the jury is still out as to whether size matters. 200 Words Or 2000 Words. How Do You Choose? Should you write a 200-word blog post or a 2000-word post? If you’ve ever asked this question before, I’d be willing to bet that the answer you received was “it depends”. What a wholly unsatisfying answer! Yes it depends, but we have access to a wealth of data now. We can create rules of thumb. Forget ambiguity. Here’s a concrete answer for you, courtesy of Neil Patel, “If you’re looking for numbers, a post that is above 1,500 words seems to be in the zone of ideal length. I’d shoot for that if I were you.” Orbit Media wholeheartedly agrees advocating that blog posts should be 1,500 words, if you’re looking for your content to rank in search engine results pages (“SERPs”). Why Is 1500 Words The Golden Rule For Blog Posts? But things have changed. People do read online content now. To a large extent, this has to do with the internet community putting a huge emphasis on readability. Nowadays, it’s best practice to use a lot of subheadings, use short paragraphs and sprinkle in some striking images. In other words, with a bit of formatting wizardry, a 1500 blog post becomes gentle on your reader’s eyes and brain, making it very readable indeed. With that main concern swept aside, let’s address the 3 main benefits of 1500 word blog posts. Shocking, right? On average, every single page in the top 10 of Google’s rankings contains more than 2000 words. So why am I recommending 1500 words? Well, “content” on this chart actually includes navigation and sidebar content as well as other page elements. Thus, the chart tends to inflate the length of unique content on each page. Longer pages better communicate their subject matter to Google, so Google can feel more confident about categorizing it. Google knows that a longer page (generally) has a much better chance of answering the searcher’s question, and thus ranks it more highly. A longer post generally touches on more topics, meaning it is relevant to a wider variety of keywords that people search for. So, if you want to get in the Googlebot’s good books, keep your content thorough. Aim for 1500 words. Nowadays, one of the best ways for corporations to broadcast their message is through social media. Yet, all too often, companies distribute their blog postings through social media and see no traction whatsoever. There are many reasons why this might occur (the headline isn’t compelling, their following is limited, or the quality of the content is poor). 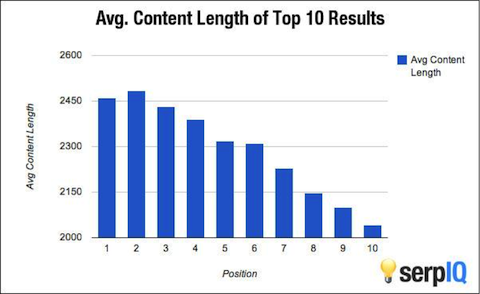 But the data tends to suggest that content length plays an important role too. Astonishingly, posts that were over 1500+ words received 87% more LinkedIn shares, 66% more Facebook shares and 51% more retweets than comparable posts which were under 400 words. So, if you want to set the social world abuzz, it appears that longer, richer content is the way forward. Regardless of the actual percentage, backlinks are a very important means of conveying to Google that your post is both popular and credible. Popularity and credibility directly lead to higher search rankings, which in turn, lead to more traffic to your website. The advice I’ve dished out above does have a caveat. It assumes that the main goal of your content is to increase the amount of website traffic that you receive as a result of organic searches and social media shares. If this is not your main aim, then my advice should be taken with a grain of salt. Substance: How meaty is your topic? What do you need to say in order to get your message across? If you can say it in 200 words, don’t use 2000. Style: Some writing styles lend themselves to content that doesn’t beat around the bush. It’s straight to the point. Other writing styles are more conversational and interactive, and require more words for the same message. Writers like Seth Godin need less than 300 words to get their message across, whereas the Neil Patel’s of the world need thousands of words to deliver their message. It all comes down to style. Purpose: What is the purpose of your content piece? You could be looking to convert your reader into a lead or to get them on your e-mail list. Alternatively, you could be seeking to enhance your website’s SEO or to educate your audience. Regardless, the purpose of your piece will heavily influence its length. Frequency: If you’re a prolific poster, churning out at least one blog post per day, you’d expect your posts to be a bit briefer, because you have less time to research and write them. However, if you leave your audience waiting a week, they’re likely going to expect a much weightier piece. What rules of thumb do you use to determine blog post length?